New Product Dissolves Concrete Safely! For years, our customers have been asking, "How can I remove the cement splattered all over my car?" This is the only product we've found that can do it safely, and effectively. 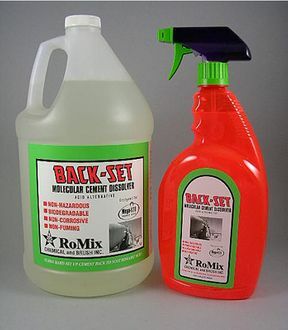 RoMix Chemical Company developed this molecular cement dissolver as an alternative to using hazardous acids for concrete removal. Back-Set is a one-of-a-kind formula. It uses an active ingredient found in sugar cane syrup, and is completely biodegradable. The effects of sugar on concrete have been known for many years. In some parts of the world, sugar is commonly used to retard the set of mortar. the December 1957 issue of "Concrete Construction" said, "Sugar affects both fresh and hardened concrete. ... Dry sugar has no effect on hardened concrete, but sugar solutions can be very corrosive." RoMix turned this vulnerability into an opportunity. "Back-Set" safely removes hardened concrete from a variety of difficult to clean surfaces. It break down the ionic bond in portland cement, releasing the cement from any surface to which it has adhered. Chemically speaking, Back-Set converts the positive ions in the hardened matrix into negative ions, which dissolves the cement into mud that can be rinsed away. Because it works chemically, rather than mechanically, Back-Set may be used to remove cured concrete, mortar, grout, and stucco from virtually any surface without harm. This is my 1970 Mustang fastback with original paint that had been in storage for 25 years under a concrete structure. The rain dripped through the cracks and left concrete (mineral) deposits all over the back of the car. I took the vehicle to a body shop and they wanted $5500 for repair! I thought it was hopeless until I ordered Backset. I left the product on for 4 nights keeping the area moist. I'm very happy with the results, so wanted to share my before and after photos. will not remove rubberized cement. Watch Back-Set in Action. Click the Romix Movie Icon Below. Note: The below video file Is 17.8 MB and may take some time to download. It Is NOT Intended for a dial-up Internet connection.